This editorial, high-fashion image was created by photographing the bride in her home as she prepared for the wedding ceremony. The bride and her dress were very glamorous, so dramatic lighting was used to reflect that. The chandelier was heavily featured, as well, inspiring an Old Hollywood vibe. This photo was taken with a Nikon D750 DSLR at ISO 500, f2.8 aperture, 1/200th shutter speed with a Nikon Nikkor 24-70mm f2.8 zoom lens, at 32mm focal length. 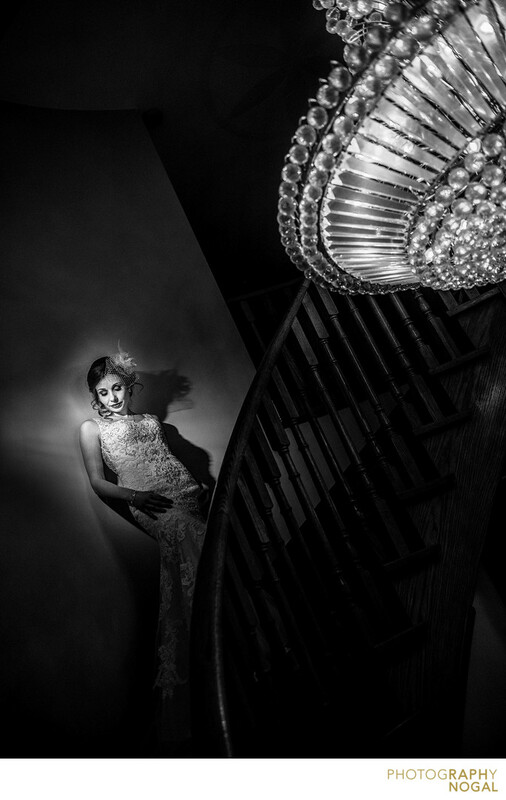 The lighting used was a speedlite / speedlight flash fitted with MagMod grid (MagGrid) to focus the beam of light onto the bride's face and upper body, creating a dramatic image.